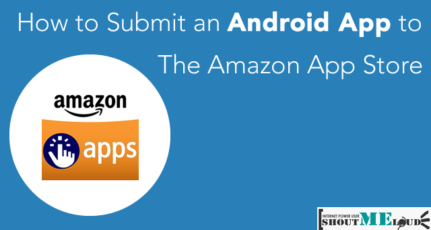 Do you have a mobile app in Google play store but you are not getting enough downloads? Are you planning to have a mobile app in the future? Creating an app and the process of uploading it and optimizing it to get the best results are equally important tasks. 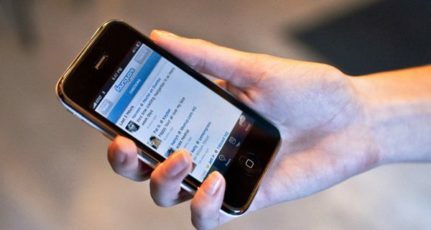 Here are the best ways to optimize your mobile app to get best results. How are Apps Ranked in Google play? 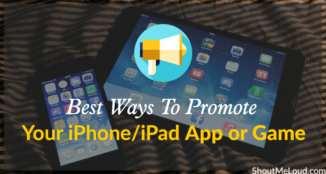 The whole idea behind ASO is to optimize your mobile app to make your app appear on top. And, hence, drive users to your app page and increase downloads. If your app is shown on top of other similar apps, the chances of a user downloading your app over the other app is very high. No magicians know the correct algorithms used by Google Play store for ranking the apps, but experts tell there are certainly few ranking factors which play the most important role in ranking of your app in App store. We will be talking about Google Play Store, other app stores also follow similar factors. Downloads– The no of downloads of your app reflects the popularity of your app. The more downloads your app has, the more chances it has of being in the top search results. 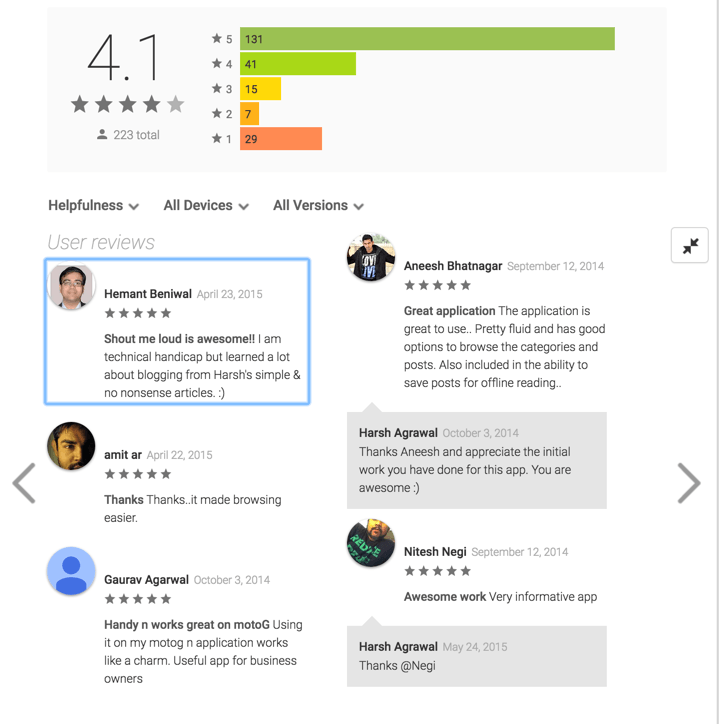 App Reviews and Ratings– Quality is sure a factor Google gives importance to and it reflects in the search optimization. Apps having more positive reviews and better ratings are given a much higher preference to the apps having lower ratings by users. Less popular apps with lesser downloads but better ratings are ranked higher than popular apps with a lower rating. Long Installs– For how long your app is kept installed by the user in their mobile is surely a factor which Google consider. Google seems to track the time of app installation and give positive points for longer installed apps. Uninstalls– Instant uninstallation of the apps after being downloaded or uninstallation of the app after the latest version is released will certainly get your app bad ranking in search results. Social Links– Apps on the play store are also linked with Google +1 boost are called as recommendation. More the +1’s or recommendation, better it is for the app. App Title: The name you give to your app can work both in positive and negative ways in the app search box. If your app title has the right keywords related to your app, it increases the chances of getting discovered by users in search. Use your main keyword in the app title. While naming the app, resemblance with the popular apps that are already in the market should be avoided. If a user searches for your app that has a similar name to a popular app, Google might autocorrect the name or suggest user to the popular app instead of your app. Description: Short and Strong should be your policy while giving the description of your app. Describe what your app does. Do not forget to include social proof such as awards or got covered by leading media agencies. Only a few lines are shown in the description. So it is recommended to use fire words. Do add your target keyword 3-4 times in the description. Do remember that first 167 character of your app description becomes the Meta description for search engine. Use AppAnnie: App Annie will help you to identify top keywords and creative assets to maximize organic app downloads. Google app store has millions of apps and there is a very strong probability that there exists an app similar to yours. So it is very important to convert every user who is on your download and details page to make the user install the app. Screenshots of the app and its design are the way a user gets to see what will he get after downloading the app. Uploading high definition screenshots of all sizes will surely increase the chance of a user downloading your app. Google app store also allows the developer to show video of the app in the details page. With this feature, you can showcase the distinct features your app has and can convince the user to download your app. Graphics play an important role in App store. From app icon to graphics used to showcase app is one big thing that catches the user eyes and makes them stick to your app. 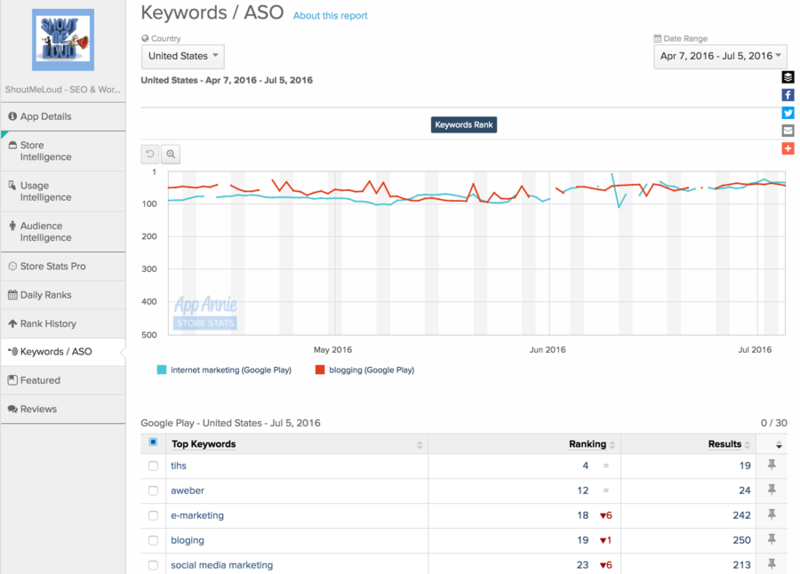 The rating of your app is directly related to the search ranking of your app. If your app has a 5-star user rating then you stand a higher chance of being shown in the search result when a user searches for a particular category of app in which your app falls. Ask the users to leave a feedback and promote your app to get a 5-star rating on the play store. Optimize your mobile app and add a call to action button in your app asking users to leave a review about your app on play store. The feedback left by the users can be used to improve the next version of your app so that your app users can have a better experience. Read the reviews written by the users and fix the problems in upcoming versions. Having better social connection on other social media platform also makes your SEO strong in general search engine which increases the traffic you get to the app page. Different app appeals to a different type of audience. The audience can vary on factors like location, age group or other factors. For better marketing and success of the application, it is important that we find our potential audience and users. Targeted mobile apps perform better than a generalized app. There are certain more small factors to optimize a mobile app for google play store and get better search results. Responsive apps- Various kinds of devices like mobile, tablet etc.exists in the market. It is recommended to make apps that are compatible for all kinds of devices. Tablets compatible apps increase traffic and also increase your chance of being shown better in search results. Smaller size– Memory is limited in the mobile devices and a user wish to make the most out of it. If you make a heavy and bigger size app, there is a high chance of being uninstalled. It is recommended that developers make apps that are small in size and take less space in mobile devices when installed. 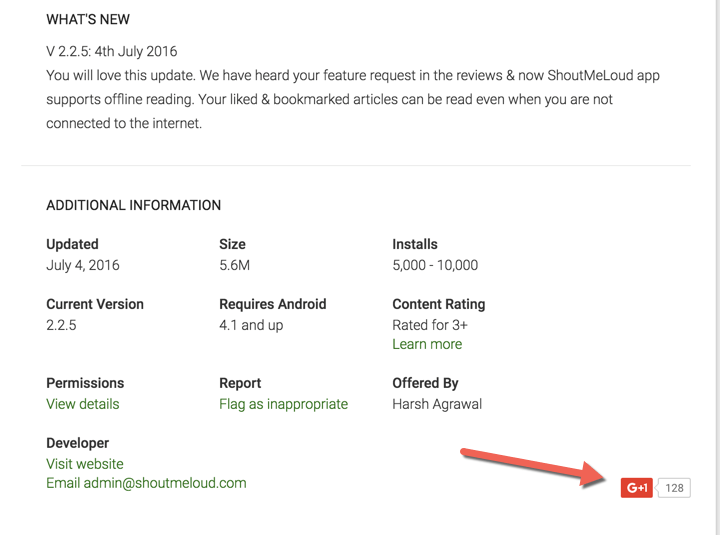 Incoming links: Like SEO for normal sites, more internal link to your app page will help in improved ranking. This guest post is submitted by Dil. See ShoutMeLoud guest submission guidelines. Knock knock! its not a joke. Do not open the door. I think you have swathed all points in this post, for better search rankings of an android app. 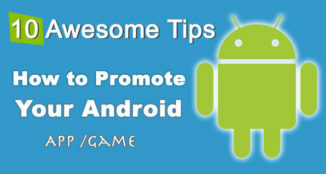 Well described every topic whether it is ASO, How App ranked in Google Playstore and tips to Optimize Apps. I read your complete post and would say I enjoyed it thoroughly. Thanks to sharing this worthwhile post with us. Imran, am glad you liked my article. 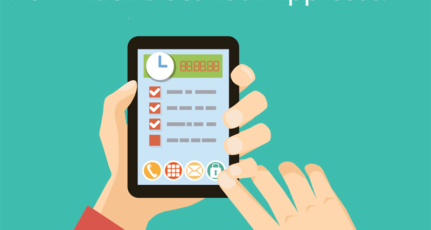 Use these topics to achieve better results for your apps. Hey Dil, Thanks for your detailed guide about ranking apps on app store. I have a question. To submit any app in google play store, I have to pay??? Yes, you need to pay $25 one time fee. Hey Harsh, is the $25 for one app or for any limited number of apps? For any number of apps. Please tell me, does advertisement is an app affects its ranking? Umair, advertising does not affects ranking as such. But if your app has google powered ads and your app was passed by google when you submitted for AdMob, that definitely shows that google accepts you as a unique and original app and that’s why it approved your app for ads. This may internally affect the ranking of app on factors of good and bad. Even though I haven’t develop any app yet,but when I do, this should certainly help me out.. Thanks.. This article was really important for me. I have more than 25 apps in Google play store and I was really looking for the factors that really matters to rank an app higher in play store. I also have the Android app and iOS app for my blog and I was thinking how can I rank higher for the app in Google Play store and just got the article in ShoutMeLoud. Thanks again for the nice share. Glad that you liked the post. I am seeing a lot of comments from you. 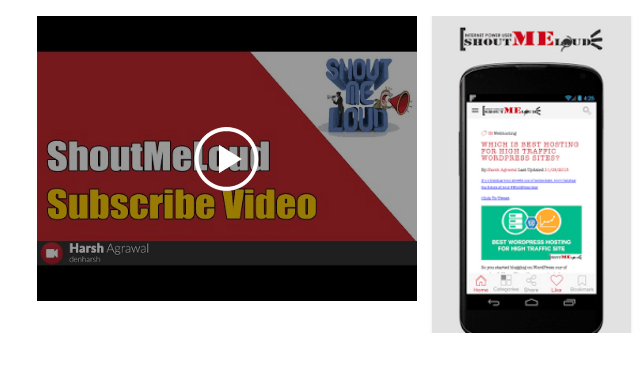 Thank you for a being a avid reader of ShoutMeLoud. I am glad you found the article useful. 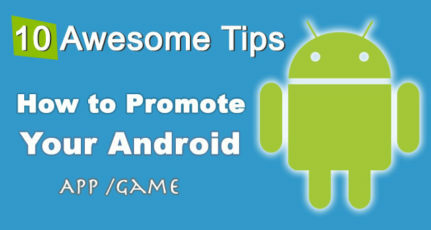 You can use these tips and achieve better result for your apps. Hello Dilip, you have done a great job. Responsive apps, and app size are two important elements that bloggers often miss in their blogs. Whenever you are developing an app, you should make it compatible with various devices. A large size can make your user compel to uninstall the app. Therefore, both of these two factors should not be ignored. I don’t agree with the incoming links point. Playstore ranking mainly depending on the number of installs and the number of installs and user rating. But yes, if you look at some high ranking apps, they got better PA, I think it is because of the app popularity. many websites autocrowl the playstore and fetch & post the apps on their website where a simple download link pointed to the play store’ page which helps increase in PA.